The United States and the Iraqi government are launching a new diplomatic initiative to invite Iran and Syria to a "neighbors meeting" on stabilizing Iraq, Secretary of State Condoleezza Rice said Tuesday. "We hope that all governments seize this opportunity to improve their relations with Iraq and to work for peace and stability in the region," Rice said in remarks prepared for delivery to a Senate committee. Excerpts were released in advance by the State Department. After first rejecting much of the Baker-Hamilton Report, the White House is now embracing a key component of it — engaging directly with Syria and Iran, reports CBS News correspondent Jim Axelrod. The move reflects a change of approach by the Bush administration, which previously had resisted calls by members of Congress and by a bipartisan Iraq review group to include Iran and Syria in diplomatic talks on stabilizing Iraq. "I am pleased to announce that we are also supporting the Iraqis in a new diplomatic offensive: to build greater support, both within the region and beyond, for peace and prosperity in Iraq," Rice said, adding that U.S. and Iraqi officials agree that success in Iraq "requires the positive support of Iraq's neighbors." At the White House, press secretary Tony Snow told reporters the administration is "happy that the government of Iraq is taking this step and engaging its neighbors. And we also hope and expect that Iran and Syria will play constructive roles in those talks." But Snow cautioned people to be patient, noting that "this is one where the agenda is being set up by the government of Iraq. And the conditions, especially for bilateral conversations with the Iranians, are pretty clear." The administration in recent weeks had increased its public criticism of Iran's role in Iraq, charging it with supplying deadly weapons, including advanced technologies for the most lethal form of roadside bombs. The administration also has accused Syria of harboring anti-Iraqi government forces and allowing weapons to cross its border. Rice and Defense Secretary Robert Gates testified Tuesday before the Senate Appropriations Committee on the administration's budget request for the wars in Iraq and Afghanistan. The Iraqi government announced in Baghdad that it is preparing the meeting for mid-March, and that invitees include members of the Arab League and the five permanent members of the U.N. Security Council. The conference will focus on reconstruction issues and economic development as well as security, adds Axelrod. Syria will be represented at the conference by Ahmed Arnous, an aide to the foreign minister, an Iraqi Foreign Ministry official said, speaking on condition of anonymity because the plans had not yet been formally announced. Other Arab countries and Iran have not confirmed their attendance or the level of delegates they would send. Rice said the mid-March meeting will be held at the sub-ministerial level. That is to be followed, perhaps as early as the first half of April, by a full ministerial-level meeting with the same invited countries, plus members of the G-8 group of leading industrial powers. "I would note that the Iraqi government has invited Syria and Iran to attend both of these regional meetings," Rice said. She also noted that the Iraq Study Group, headed by former Secretary of State James Baker and former Rep. Lee Hamilton, had recommended inviting Iran and Syria to such a neighbors meeting. 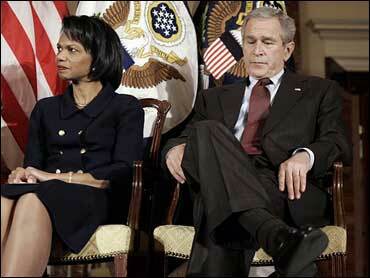 At the time of that recommendation in December, President Bush rejected that diplomatic approach.